When it comes to our gardens we want to ensure they’re looking their best, but we don’t always know the best way to go about it. We want the neighbours to peek over the fence and think “Wow, wish I’d thought of that” but even the most creative of us can feel stuck for ideas. Never fear, here are some amazing things you didn’t realise you could do with your garden, that are quick and easy. A pond in the garden is a joyous thing, not only because it looks great, but because it attracts some rather incredible wildlife too. If you’ve always wanted a garden full of frogs perching on lilypads then you need to build a pond. It is a lot easier than you think, as long as you have the space and the terrain for it. Start by measuring the area that you require, marking out where you want to dig using string. Next, use a spade to create the first ‘shelf’ which should be fairly shallow, but as long and wide as your entire pond. Then, move further inwards and make another shelf, that is slightly deeper than the one before. Keep on going until you have a hole that is the required depth. Next, remove anything sharp (like stones) from the bottom of the hole and line with some builders sand, pond underlay and finally some butyl liner. 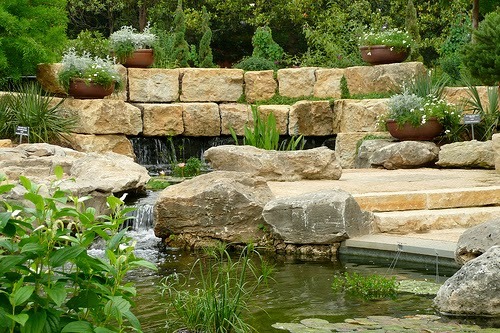 Finally, fill up the pond with water and surround your new area with plants, rocks, paving slabs or shrubbery. There’s a big design trend in 2014; it’s all about the levels and layers in your garden. You don’t have to invest a fortune in landscaping in order to be on trend this year though, as all you need are some railway sleepers to recreate this stunning look. The easiest way to create an extra dimension in your garden is with raised beds, which will look fantastic and give you more space to house beautiful flowers. They make a great alternative to rock gardens or flower beds built out of rock, stone and brick; thanks to the natural wood they are made from. Decide where you want your new flower bed to be and lay the railway sleepers in place, making sure that they slot together. Next, fasten them together by using sleeper screws that will hold the wood firmly in place. Add on another layer and repeat the process, until you have the desired height of your flower bed completed. You may wish to add a plastic lining to the inside before filling with soil, so that nothing leaks out of the natural gaps between the wood. Now fill with your favourite flowers, vegetables, herbs or shrubs. This is a rather bizarre thing to do with your garden, but something that seems to be growing in popularity. A lot of people are using the space in their garden to create an area in which they can work from home. There are a whole range of weird and wonderful designs out there, from the basic garden shed office to a futuristic pod, and even office tree houses. Although this may take a bit more work than a pond or flower bed, it sure is the perfect way to impress the neighbours. We hope we’ve given you some garden inspiration already! Use the internet to discover what amazing things other people have done with their own garden and see how you can recreate that look in your own backyard. i love those levels, indeed, we do not need to spend so much to make garden look great, we just need out creativity sometimes if not, most of the time.